Wednesday, August 28: Large numbers of Chimney Swifts are coming to roost each evening at the Walkerville High School. 255 swifts were counted diving into the school chimney between 8:10 and 8:30 pm tonight (C. Baker & J. Tuite). The swifts are best viewed from near the tennis courts behind Walkerville High School (in Windsor, located at 2100 Richmond St., two blocks west of Walker Rd.). Remember that the swifts will arrive earlier in the evening as our day length decreases. Monday, August 26: Steve Paiero disovered a new damselfy for Canada today while searching for insects in the Ojibway Prairie Provincial Nature Reserve. Great Spreadwing (Archilestes grandis) is a southwestern species whose North American range has been slowly expanding into the northeast. Monday, August 19: Visit the Windsor-Essex Health Unit's web page on West Nile Virus for information on prevention and current surveillance. The nature centre now carries the excellent Stoke's Beginner's Guide to Dragonflies ($13.95). 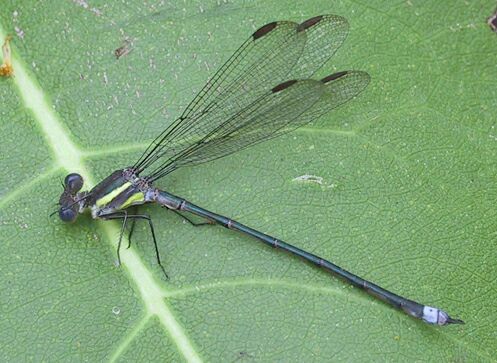 It illustrates 80 percent of the dragonflies and damselflies found at Ojibway! Wednesday, August 14: A metallic wood boring beetle from Asia was identified for the first time in North America in recent weeks. The Emerald Ash Borer, Agrilus planipennis, has the potential to become a serious pest of ash trees in North America. This insect has likely been present in the Detroit area for several years as it has already spread through five counties in Michigan and is now present in Windsor. For more information and photographs visit the Michigan Department of Agriculture. A quick check at Ojibway revealed many ash trees that appear to be dying from a heavy infestation of this insect. Emerald Ash Borers must have been present for a couple of years to cause this damage. Since ash is not a dominant tree of the overstory here (this beetle does not feed on other kinds of tree), the loss of these trees will not have a serious impact on the park's forest. 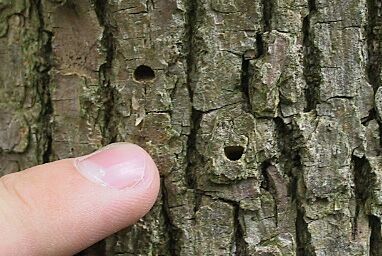 There are also signs that woodpeckers are feeding heavily on the larvae. Perhaps this is why we have had good numbers of woodpeckers in the park this year. Thursday, August 8: The Perseid meteor shower will start on Sunday and peak this coming Monday and Tuesday. The best time to watch for meteors is in the early morning before the sky starts to brighten. This is the time of day when the sky faces directly into the oncoming swarm of dust shed by periodic comet Swift-Tuttle. Northern True Katydids (Pterophylla camellifolia) are now calling each evening. Their loud, distinctive "katy did, katy didn't" song is common over much of the Northeastern US but in Ontario they can be heard only in the extreme southern portion of the province.